Users with low-powered Windows desktops and laptops will be able to run games at 1080p resolution with frame rates of up to 120 fps, using GeForce NOW. 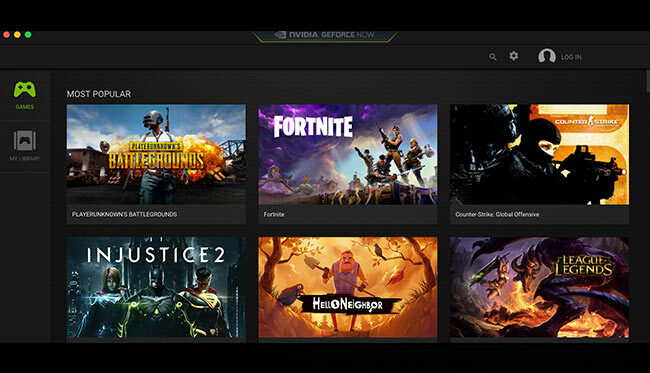 NVIDIA announced the availability of their GeForce NOW service for PC at CES 2018 as a free closed beta. This service enables anyone with a Windows-based or Mac-based desktop or laptop to play high-end PC games using NVIDIA’s data centers. By signing up for the closed beta service, users will be able to play their purchased video game titles from their Steam and Uplay accounts at a maximum resolution of 1080p and frame rate of up to 120 fps. Essentially, this service gives its users real-time compute resources through NVIDIA’s virtual machines to deliver high performance graphics for games. The service was launched for Mac users last year and now PC users can also try it out too. GeForce Now is only available to the North American and European regions and interested users are being given access through a waitlist. There’s a little bit of confusion looming with the naming of this service since a similar service is already available for NVIDIA’s SHIELD. SHIELD owners can subscribe to the GeForce NOW game-streaming service, formerly called GRID, where games can be streamed directly to their SHIELD devices. This service specifically mentions the use of GTX 1080 GPUs to run games and deliver it straight to your device without a PC. 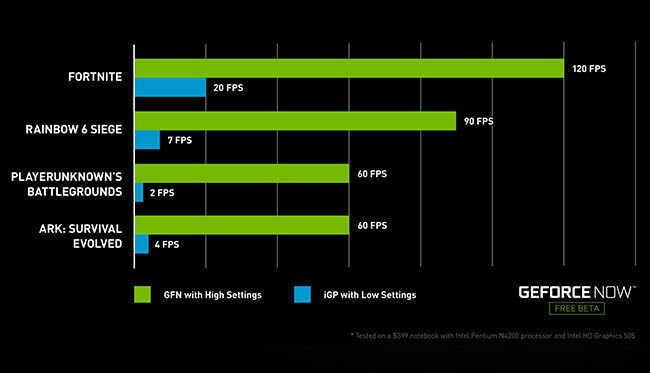 Essentially, after this launch, GeForce NOW covers different platforms including the SHIELD, PC and Mac devices. Not only will you be able to enjoy AAA titles in the highest settings on your potato PC, laptop or Mac, you can simply connect the SHIELD to your TV to use the same service. More than 150 games are supported on the GeForce NOW platform, including Free to Play games. Some of them include ARK: Survival Evolved, Call of Duty: WWII, DOOM, Dota 2, The Elder Scrolls V: Skyrim, Fallout 4, Fortnite, Half-life 1 and 2, Just Cause 3, League of Legends, Overwatch, Playerunknown’s Battlegrounds, Rise of the Tomb Raider, Star Wars Battlefront II, The Witcher 3: Wild Hunt - GOTY, and many more. You can find the rest of the growing library of titles here. All these games can be played at a maximum of 1080p resolution with 60 fps in frame rate. If you want to go a step further, the Ultra Streaming Mode bumps up the frame rate from 60 fps to 120 fps. Do note, you have to own the game on supported digital stores in order to play them through this service. You will be able to connect your Steam and Uplay PC library to the service for now. Integration of other popular stores will soon be added. During the free beta, you will be able to play every game for a maximum of four hours. A new session has to be started every four hours so that one user isn’t hogging up the data center resources alone. This limitation should be lifted for individual users when the service goes fully commercial. There’s no limit to the number of games you can install through your GeForce NOW account. Any game can be installed in your virtual gaming rig within seconds with all the latest patches and drivers installed. Game storage size is unlimited which essentially means that you won’t have to bother about uninstalling a game anymore. With NVIDIA taking care of all the technical aspects of running the game, you don’t have to worry about updating games anymore. All the latest patches and updates from the game developers will be automatically updated by NVIDIA. This will also include automatic graphics driver updates. Apart from them, the service supports cloud save for cross-platform play. This means that your latest progress on a specific machine will be saved and you can start off from where you left on a different machine. Surprisingly, there’s no mention of the Mac Pro or the recently launched iMac Pro. Clearly, you don’t need a powerful desktop or laptop to run the games, but you will still need a high-bandwidth internet connection. The data centers will be pushing a lot of graphics to your machine and pulling a lot of compute data from your end. To ensure a smooth service, GeForce NOW demands a minimum of 25 Mbps in download speed. The recommended download speed is 50 Mbps or higher. Your download speed isn’t the same as your internet’s bandwidth, since they have specifically mentioned “download speed” under system requirements. In terms of connectivity, you will need a hardwired ethernet connection or a 5GHz wireless router. We are curious on how different bandwidths will affect the service. For example, whether we’ll be able to lower the graphics settings to compensate for a lower download speed. 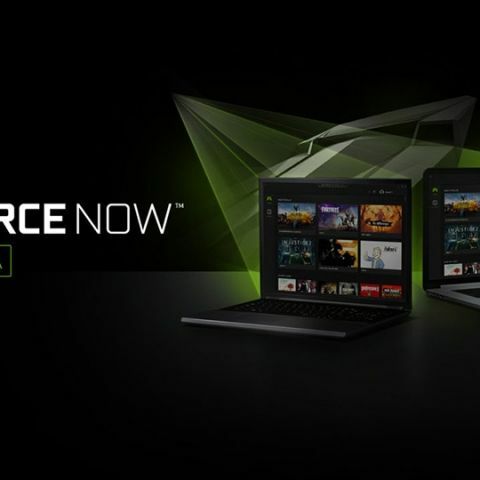 GeForce Now was already available in beta for Mac users previously and now it has been opened up as a closed beta for Windows desktop and laptop users as well. Currently, it’s available in “most of North America and Europe” with no details mentioned for other regions. You can find the current active regions for the SHIELD’s service here which should be the same. They haven’t released any pricing details and it’s safe to assume that it would be around the monthly $7.99 pricing on SHIELD’s GeForce NOW. Since the service is free for now and a closed participation, NVIDIA is taking requests for beta access. You can sign up to get yourselves added in the waitlist here. Why are games such as GTA V,Watchdogs,Fifa 15 lagging highly on my pc(even on low resolution & settings)? Radeon R5 M330 vs GeForce 940M .